The United Nations has a three-pronged strategy to address misconduct: prevention of misconduct, enforcement of UN standards of conduct, and remedial action. Actions are taken in each of these areas to address all types of misconduct, with a particular focus on addressing sexual exploitation and abuse. The first and most important action in addressing misconduct is preventing it from taking place. Prevention of misconduct must be undertaken in a proactive and comprehensive manner in partnership between the United Nations and its Member States, from the time missions are being planned to when personnel deploy and carry out their duties in the field. A variety of prevention measures are put in place at UN Headquarters and at field level. These measures include training of personnel on the UN Standards of Conduct both before and after deployment and public outreach to the host population through broadcast messages, the dissemination of brochures, poster campaigns and meetings with community groups. 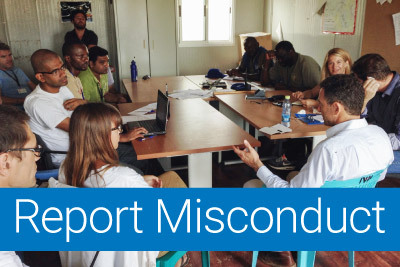 The UN also conducts vetting of individuals for records of prior misconduct while in the service of a UN operation and conducts risk assessment and risk management activities in the mission area. Further preventive measures at field level, depending on the risk factors that are present, can include restrictions of movement, curfews, requiring soldiers to wear uniforms outside barracks, designating off-limits areas, instituting non-fraternization policies, increased patrols around high risks areas and decentralization of conduct and discipline personnel into locations with a potentially high risk of misconduct. Effective prevention activities constitute a solid foundation for ensuring that all UN personnel deployed in field missions maintain the highest standards of conduct and integrity at all times. The array of prevention efforts continues to be strengthened, most recently with the launch of a new online training programme on the prevention of sexual exploitation and abuse.